Michael previously wrote the popular blog 35 Years of David Lynch and edited the acclaimed fan cut Dune: The Complete Saga. Michael takes this opportunity to write and imagine the experience of discovery and contemplation of David Lynch’s films as a book and finish what he started five years earlier in his blog, but now with volumes of additional new material found nowhere else. 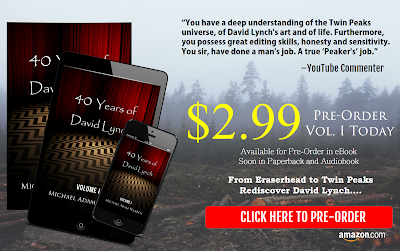 Michael adds new layers of literary content exclusive to 40 Years of David Lynch, including new insights and analysis as he sits down with the reader to re-watch David Lynch’s filmography all over again with fresh eyes five years later. Michael engages readers on a whole new level of understanding in this book, creating a wholly unique, humorous, and entertaining experience for readers. Once complete, 40 Years of David Lynch will fill four volumes on paperback, which are designed to rest together attractively side by side as a set on your bookshelf. It will also be released on eBook and eventually on Audiobook, narrated by the author. This multi-volume book series stands on its own to encourage new and older generations of viewers alike to take a closer look at a body of artistic work that challenges us to think a little deeper and to dream a little bigger. And the television landscape would never be the same again after David Lynch released his TV masterpiece Twin Peaks (1990-91) and later its prequel film Twin Peaks: Fire Walk with Me (1992). The series resonated with viewers across the world and had a profound impact on the next generation of TV showrunners—many of whom were inspired to usher in a more sophisticated era of television that we currently enjoy today. Volumes I, II, and III will cover all motion pictures written and/or directed by David Lynch, while Volumes IV will be comprised of a deep analysis of Twin Peaks: The Return, particularly the new revival of Twin Peaks 25 years later. Volume IV will fully justify the title 40 Years of David Lynch as Michael examines in detail all 18 parts of the new Twin Peaks, which David Lynch co-wrote and personally directed. They are slated to begin airing soon on the premium cable network Showtime, starting May 21 and ending September 03, 2017. 40 Years of David Lynch is the perfect companion for anyone interested exploring this fascinating director’s body of work over the course of his career, and arrives just in time for a whole new chapter of storytelling to begin. This singular artist continues to mesmerize us forty years after first arriving on the pop culture scene with his first feature film Eraserhead (1977). And he has not yet failed to engage our imaginations ever since. So expand your horizons and get Lynchian, as we explore the abstract, strange, yet serenely beautiful artistic worlds of David Lynch.